If you’ve never heard of the Roadless Rule, you’re not alone. It’s an important conservation tool that protects many of our most valued backcountry recreation areas. Senator Murkowski (R-AK) recently introduced a measure that would eliminate protections for roadless areas in Alaska and the state of Alaska has filed a petition with the Department of Agriculture asking for an exemption to the Roadless Rule. These actions set the stage for other states to seek exemptions from the Roadless Rule, putting backcountry recreation at risk. What is the Roadless Rule? National Forests provide lots of resources to Americans, including timber, fresh water and clean air, and access to outdoor recreation. Right now, about 50% of our National Forest land is open to drilling, logging, and mining; and 18% of is protected as designated Wilderness. The remaining 30% of forests are known as Roadless Areas. These remote landscapes are treasured by our community for the backcountry recreation they provide. These backcountry landscapes are governed by the Roadless Rule. The Roadless Rule was established in 2001 after enormous public outreach and was intended to “provide lasting protection in the context of multiple-use management” for the 60 million acres of roadless areas on our National Forests and Grasslands. What this means is that we cannot build new roads or harvest timber on these roadless areas, but they are still open for a range of recreational activities, including climbing, hiking, mountain biking, paddling, and backcountry skiing. While these areas are protected from new development, they are less restrictive than Wilderness areas in terms of what you can do there. Interactive map highlighting roadless areas (orange) across the U.S. Click here to open in a new window. Have I recreated in a Roadless Area? Though you might not know it, the Roadless Rule has been instrumental in protecting outdoor recreation experiences across the country. 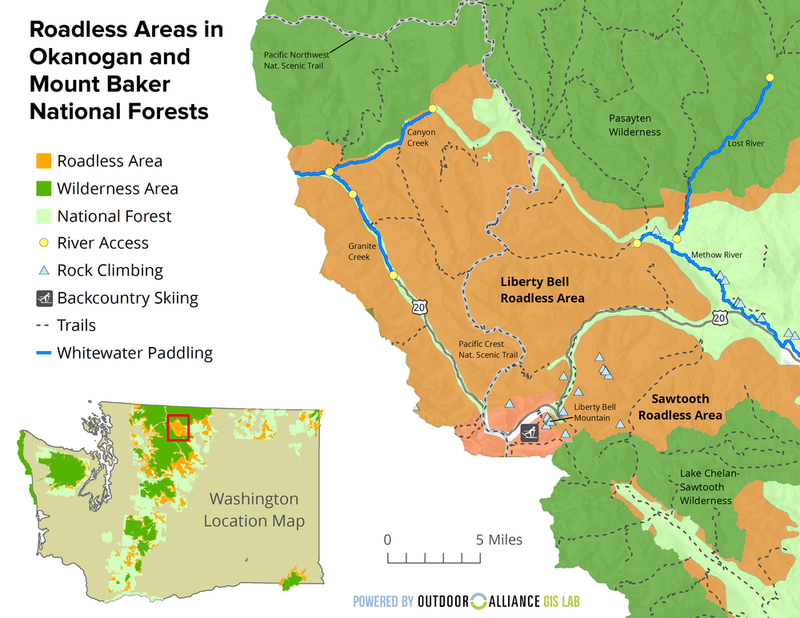 Roadless areas are found in 42 states and Puerto Rico (check out this map, and click on “Roadless Areas” to see all the backcountry areas protected by this rule). They are home to recreation gems like the Pacific Crest Trail, which passes through several roadless areas in the Cascades and Sierras on the West Coast; alpine summits like Wyoming’s Franc’s Peak — the highest peak in the Absaroka mountains; Montana’s Hyalite Canyon — a world-renowned ice climbing destination; climbing and backcountry skiing at Washington Pass and Liberty Bell (see the map below) at the Headwaters of Washington’s Methow Valley; mountain biking on the Maah Daah Hey Trail in western North Dakota, Kettle Crest of Washington, and Tea Creek Mountain in West Virginia; stellar hiking and camping adjacent to the Dolly Sods and Otter Creek Wilderness in West Virginia; and paddling in the headwaters of the Gauley in the West Virginia Highlands and headwaters of the Lochsa in Idaho. Right now, the best thing you can do to help is write your Senator and tell them that protecting Roadless Areas is important to you. If you live in Alaska, New Mexico, Mississippi, Tennessee, Missouri, North Dakota, Kentucky, Montana, or West Virginia, your voice is especially important because your Senator is on the committee specifically reviewing the rule. You can see our full policy letter by clicking the image at right.